A majority of American teachers feel stressed at work, according to a new survey from the American Federation of Teachers — and the number citing poor mental health has jumped alarmingly over the past two years. Experts say resultant costs in human resources and health care spending could amount to billions of dollars. The figures come from the union’s 2017 Educator Quality of Work Life Survey, a poll administered to almost 5,000 teachers and school staff across the country. Results suggest a sizable increase in the number of stressed educators since the poll was last conducted in 2015. In particular, 58 percent of respondents described their mental health as “not good” for at least seven of the previous 30 days. Just two years ago, that number was 34 percent. 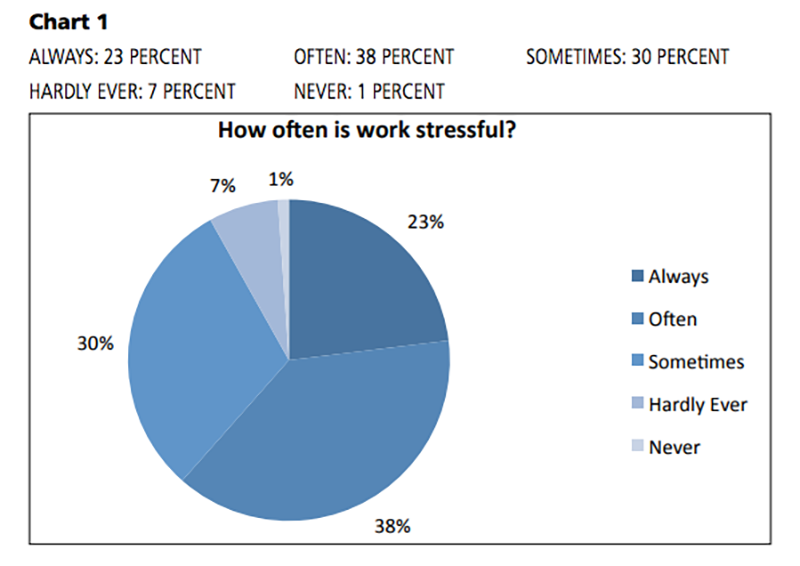 Sixty-one percent of the teachers said their work was always or often stressful. Over half agreed that they didn’t feel the same enthusiasm as when they started teaching. They reported experiencing poor health and being bullied at work — by superiors, colleagues, students, or parents — at rates far higher than are reported for other professions. And the vast majority said they are sleep-deprived. AFT President Randi Weingarten said large majorities of teachers don’t feel respected by Education Secretary Betsy DeVos and have grown demoralized over the past two years by the harsh tenor of the national political discourse. “This notion that being coarse and tough and enabling hate is OK is highly, highly, highly disruptive and problematic in schools and goes completely against what parents and teachers know is absolutely important for kids, which is a safe and welcoming environment,” she said in an interview with USA Today. 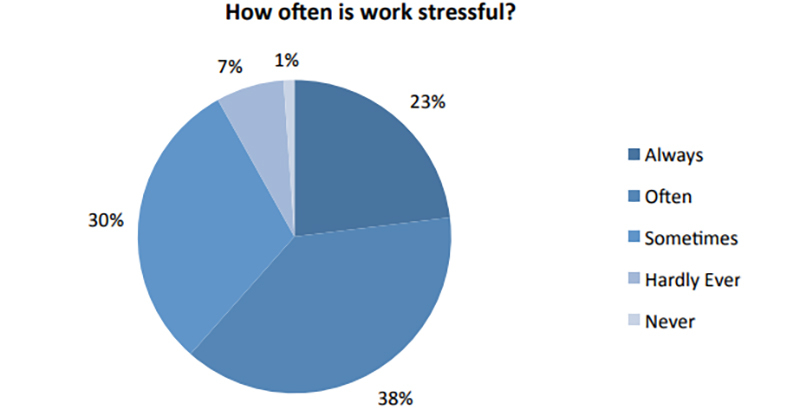 One researcher disagreed, saying the sources of teacher stress have taken shape over decades. Greenberg, who has written about the causes and impact of teacher stress for the Robert Wood Johnson Foundation, identified three major factors putting pressure on instructors: increased focus on standardized testing and accountability, unstable leadership at the school level, and inadequate resources for dealing with behavioral problems in the classroom. The common thread, he said, is that many teachers feel they have no input into decisions affecting their schools. Indeed, many respondents to AFT’s survey said they had no influence, or minor influence, on academic standards, professional development, or curriculum. Outright majorities said the same about school spending and disciplinary policies. School discipline has emerged as a particular flashpoint over the past few years as districts have moved to lower student suspension rates by implementing peer mediation and restorative justice. Teachers in Seattle, Los Angeles, Chicago, and elsewhere have complained they cannot control their classrooms under the new guidelines. The effects of this perceived helplessness are diverse and pernicious, experts say. The teaching profession is famously plagued with turnover problems, with roughly 13 percent of educators either changing schools or quitting each year. With school employees feeling increasingly tired, bullied, and powerless, researchers have pointed to a sense of professional dissatisfaction that negatively impacts student performance in both math and English. But the toll extends well past academic outcomes, imperiling public finance as well. And the continual churn of departing teachers, whose replacements must be recruited and trained at great expense, carries the highest price of all. According to Richard Ingersoll, who studies teacher retention at the University of Pennsylvania, teacher turnover costs states a total of as much as $2.2 billion each year.